Sign up sheet will be posted after Summer Swelter. Looing forward to this event Jeff. Are you planning on any list races? Yes I plan on running list races. I will start putting some more info. out after Kiwidav'e race. I don't want to take attention away from Kiwidave's race right now. I just was getting it on the calendar. With the completion of the International and the Summer Swelter approaching quickly I wanted to throw something out there and get a feel for what classes everyone would like to run for the September race. We have had a year full of stock or near stock builds with the exception of the List Races. Here's what I am thinking........Stock Inline Street class @ 20v and I would like to step it up on a 4gear Top Fuel Super Comp class @ 24v. How do ya'll feel about a 4gear Super Comp class?? Nothing is etched in stone yet. I am just putting some feelers out for some feedback. There has been mention of a possible Gasser series that could change things as well. I appreciate every one of you that has raced...donated...helped...or run a race this year!! Any other suggestions will also be considered. Thanks. This will be a PSO and 4GO List Race Event. The stock Inline class was very popular at my last race. I would suggest splitting it up between rookie and veteran however. The rookie class was popular at my event. Rookie class winners would be considered veterans. 4G super comp class sounds interesting and I would build something for that class once I see the rules. After your event I will hold the third Fall nationals at Smoky mountain in November. A gasser series might also be interesting. Would we stick with the current gasser rules or go with AFX or Inline chassis? Jeff it all sounds good. Especially the 4 gear super Comp. The Gasser's sound good to. Been wanting to build a Gasser for awhile now. If you decided to run the 4G Super Comp Top Fuel would it be rear engine ? Front engine ? Or both ? And would Fuel Altereds be included ? Just throwing that stuff out there. Stock inline if offered to everyone will definitely have to be split....Rookie and Veteran. I use the NTRA 4gear Super Comp rules, but I haven't looked closely to see if there are any discrepancies like we have found recently. But you can get look at them to know the build.....basically mean green with polys. Run at a voltage that will let them work. I will specify the exact rules once I know exactly what's running. My idea on this is to allow some of the rookies time to do a hotter build and feed the Veterans a little performance snack. The Gasser Series will depend on if Kiwidave wants to do it and would be Tjet chassis. I'm not sure how that would work at this point so I don't want to speculate on that at this time. That may have to wait till next year?? It won't change anything with these other two classes anyway. Oh yea GASSES for sure, the delivery is still sulking after the defeat at our gasser challenge. I'm going to say all of the above. 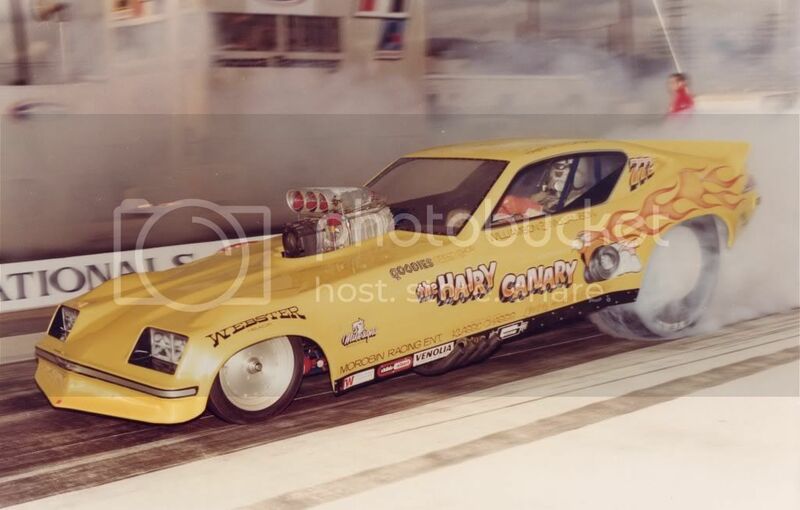 I kind of like that.......Modern Top Fuel, Nostalgia Top Fuel, and Fuel Altered. Pick your poison. I would like to hear from some of this years new racers. Be sure and chime in to let me know your thoughts. Thanks. It all sounds good to me. I'll be there for whatever classes you set up to run. When I was younger, Gassers were always my favorite class to watch so am partial to those . 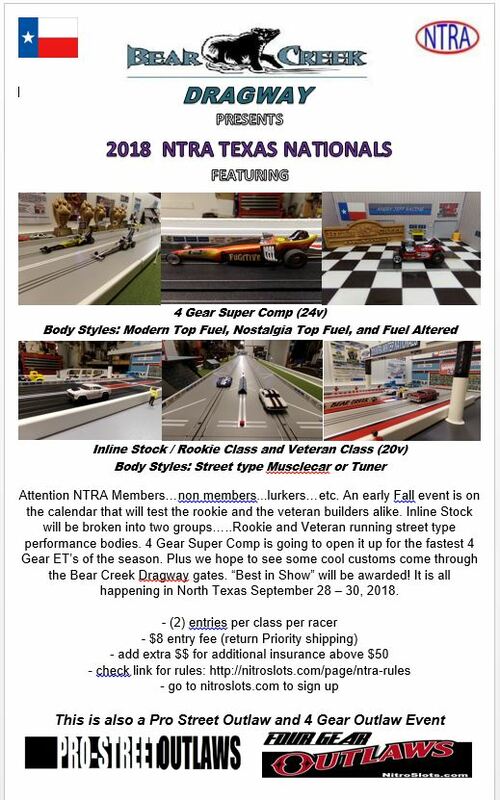 Don't have any cars ready but will do my best to get something entered in each class you offer. I think polys in any pancake will be awesome. Will definitely build cars for what ever classes run ,my favorites are the pancakes but injoy the inlines equally. Ok i have two sitting on the bench waiting on class ruling, auto world custom altered and an aurora Aztec can hardly wait been wanting to hop up bolth of these cars for some time .